*SALE MAKE* If you love wearing natural tones, you'll love this easy project! 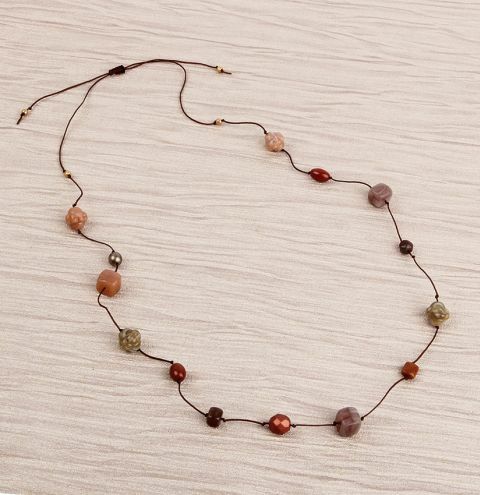 Use a mix of Preciosa beads from the Biggest Sale Ever to create a delicate beaded necklace. You'll be able to make lots of necklaces with your space cords and beads or why not try making a bracelet to match? Lay out the beads in the order you would like them to sit. This design looks best with a non-symetrical pattern, however, we did use the same beads at the top end of each side. Cut a 1m length of cord and leave about a 20cm tail before tieing a knot. String on your first bead (to sit at the top of your necklace) and tie a knot directly underneath it. TIP: To help position your knots, inset a headpin into the loop and place the headpin where you want the knot before pulling the thread tight. Continue to knot,bead, knot until you have reached your desired length. We spaced each bead approx. 3cm (1 inch) apart. The beaded section of our design (from end bead to end bead) measures 48cm (19 inches). Leave a 20cm tail at the end of you last bead. Cut a new length of cord approx. 20cm (8in) long. Take the 2 ends of the necklace cords, cross them so they point in the opposite directions and lay them side by side. Lightly knot the new cord onto the centre of your two necklace ends and then do a macramé braid for your sliding knot. Start your Macramé knotting by following the step by step diagrams below. – Take your right hand cord and pass it over the middle two cords. – Next, take your left hand cord and place it over the right cord. Move the left cord under the centre cord and up through the middle of the loop on the right side. – Pull the threads to finish one half of your knot. – Repeat this process on the opposite side by starting by crossing the left and cord over the middle cords. Follow this video from 8.18 for further help on Macrame knotting. Secure the ends with a drop of clear drying glue or clear nail polish, being careful not to glue the sliding knot to the centre cords running through it (otherwise it will not be able to slide and adjust). Try gently pulling the centre cords through the sliding knot while the glue dries. Trim the ends so the sliding knot is neat. Finish your bracelet by threading a small gold bead on to your 2 tail threads and knot them in place.